We also service the city, cities and towns of Overland Park, Leawood, Parkville, Lenexa, Independence, Liberty, Shawnee, Gladstone, Blue Springs, Kansas, MO. A wildlife expert is just a phone call away and can often assist with your Kansas City, MO wildlife control needs the very same day. Call us at 913-728-6808 or 816-484-3496 to put an end to that annoying wildlife problem and control damage wildlife causes. By hiring an ADC, Animal Damage Control, Animal Damage Control Agent, MAPAC, Problem Animal Controller, NWMO, Nuisance Wildlife Control Operator, Wildlife Management Experts, Wildlife Management Professional. 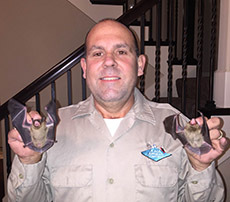 Certified Wildlife Professional or Wildlife Management Pro, you ensure a professional will be controlling, removing and will get rid of or eliminate the wildlife problem and find the best wildlife solution for the animals that are affecting you.